1. Dining room tables with extensions allow you to add more seating for family dinner. After dinner you can remove the extension and pull the extra seating into the family room. 2. Pull up seating. Garden stools, cubes and ottomans all make great, quick extra seating for big gatherings. This is key when space is a challenge and you don't have enough chairs. The stools tucked next to a coffee table keep the space open when not being used. 3. Create a cozy seating arrangement around the TV. We all know the family will gather by the TV to watch the parade and enjoy some football. 4. 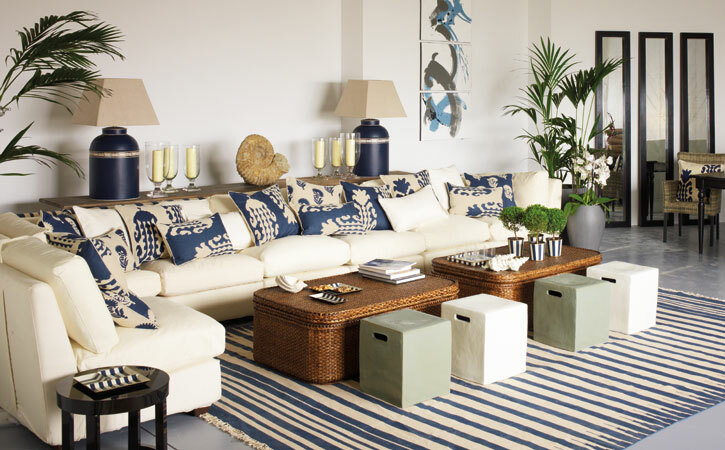 Coastal slipcover sectionals are a great way to give your family comfy chic seating to lounge on. They make perfect spots to take a quick nap from the turkey coma. 5. Don't be afraid to move your furniture from room to room. The more seating the merrier. Your family will enjoy the holiday at your home more if you have a place for all of them to relax. The two areas in the house you need to focus on for the holidays are the dining room and the family room. If you want your family to hang around, provide the right seating arrangement.